The rhetoric of digitisation pervades the contemporary political conversation. Smart devices, connected in smart homes, connected in smart cities give policymakers ever better information on which to base decisions. At the same time, the UK’s Road to Zero and its equivalents abroad present a future of carbon-neutral countries producing zero emissions. The report looks at what policy can do to ensure that our energy network has the capacity needed to cope with electric vehicles and, looking ahead, electric heating. We ask how this network expansion can best serve and profit communities across the country. Following this thread, we then consider the possibility of an uneven roll out of smart technology and associated infrastructure investment, presenting policy recommendations aimed at avoiding this situation. Smart energy has huge implications for helping people out of fuel poverty, as households will be better able to predict their bills and manage their usage, yet these benefits can only be felt through a considered roll-out of the physical infrastructure needed to deliver the smart grid. There is a risk that the infrastructure needed to support the smart city agenda is rolled-out unevenly, with areas which are already deprived being left behind more affluent places. Better physical infrastructure and smart technology could, potentially, result in less equitable outcomes. Those in higher income areas could have a higher concentration of residents willing to invest in smart technologies. This in turn could lower bills in areas of high income – while having little impact on energy bills in neighbouring lower income areas. In other words, the higher the income of an area, the greater the chances of reinvestment in energy infrastructure. 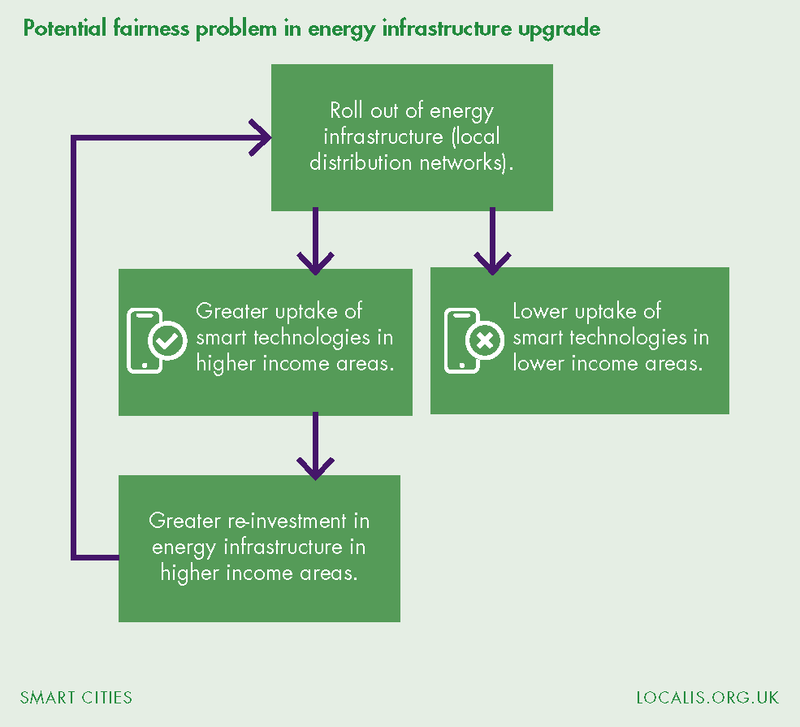 If not implemented strategically and with knowledge of socioeconomic differences between areas, the location of upgrades to energy distribution networks and later use of smart technologies could perpetuate and deepen existing socioeconomic differences. In order to produce optimal and sustainable cities, the full potential of digital infrastructure must be unlocked through pre-emptive investment in energy infrastructure. A key barrier to readying our cities for electric vehicles, recently acknowledged by the Department for Business, Energy and Industrial Strategy (BEIS) select committee, is the ability of energy network providers to invest ahead of demand. Currently, providers are restricted to investing only where there is proven need (investing after demand). Given the inevitable rise in electricity usage as a fuel source, not just in cars but also for central heating, and the increasing reliance on constant connectivity as the smart city agenda advances, we argue that this restriction should be lifted. Cities will experience the transition in different ways but the current regulatory framework will limit their ability to initiate and respond to this change. The situation therefore calls for more localised regulation. Long term strategic thinking is required in cities and their wider city-regions to ensure that everyone can benefit from the upcoming change. This is especially important as, through their energy bills, the costs of the smart grid will be socialised. Neighbouring local authorities need to work together as consortiums, with each other and with the private sector, to ensure that the various initiatives amounting to a smart city transformation are coordinated and work for everyone in the area. Adoption of the Smart Cities agenda presents a spectrum of required changes, with changes to physical infrastructure on one end and changes to cultural behaviour on the other. As one city councillor told us during research for this report, “decision-makers must take the electorate with them”. After years of telling the public to use less energy, the advent of the smart grid could lead to people using more electricity; for cars, heating and other applications. This means educating people as to the benefits of electric vehicles, as stated above, but also on the benefits of using public transport or ‘active transport’ such as cycling and walking.